During the move, the ceremonial setting up of the TV happened a bit earlier than I expected, due to the cable guy coming three hours early. No matter, I was ready, and while he was finding signal loss, I was trying to use the HDMI cable again. You might remember that I got a DVI-D to HDMI cable back in January 2008. I tried to use it, but I just did not see a difference in signal quality, and there was this nasty lag when changing channels. So when Gabe was over, I asked him about his experience with HDMI and he said he couldn’t stand the DRM wrapper it put on the video. I wasn’t sure what he was talking about until I mentioned the lag I was experiencing in changing channels, and he said “Dude, that’s the DRM wrapper I am talking about!” or something like that. 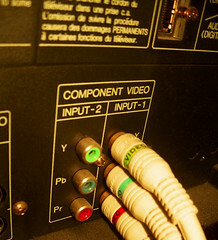 So I am back to using component video cables, because as Gabe pointed out, the ability to quickly go through the channels is of great importance. 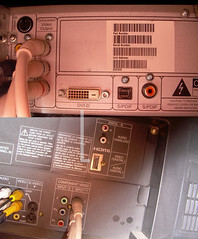 The component video cables allow that to happen, and like I said, I just am not seeing any difference in image quality. Maybe it’s me, maybe it’s my 3 1/2 year old HDTV, I dunno… but for now, we’ll do it this way.